March 7 - New location. Board meeting at 6:30 p.m. Members always welcome. Milwaukee Yacht Club, 1700 N Lincoln Memorial Dr., Milwaukee. New location. March 12 - Registration for Parade opens. Thinking of attending Parade and you're not sure what it's about? Check this page. March 15 - Fish Fry. Several menu options in addition to Wisconsin's traditional Friday fare. Details here. March 16 - The Coffee Travelers (aka Saturday Meet for Coffee). Black Canyon Coffee, 300 E. Summit Ave (Hwy 18 east of Hwy 83) - North side of the road between Culvers on the east and Wales Vet Clinic on the west. Wales, WI 53183. Stop in. We'll be there from 9 a.m. to 11 a.m. Donna Daufenbach, intrepid searcher of great caffeine, hints that the drives will be a bit further, but who cares? May 31 - DE Instructors training and solo DE event. Details here. 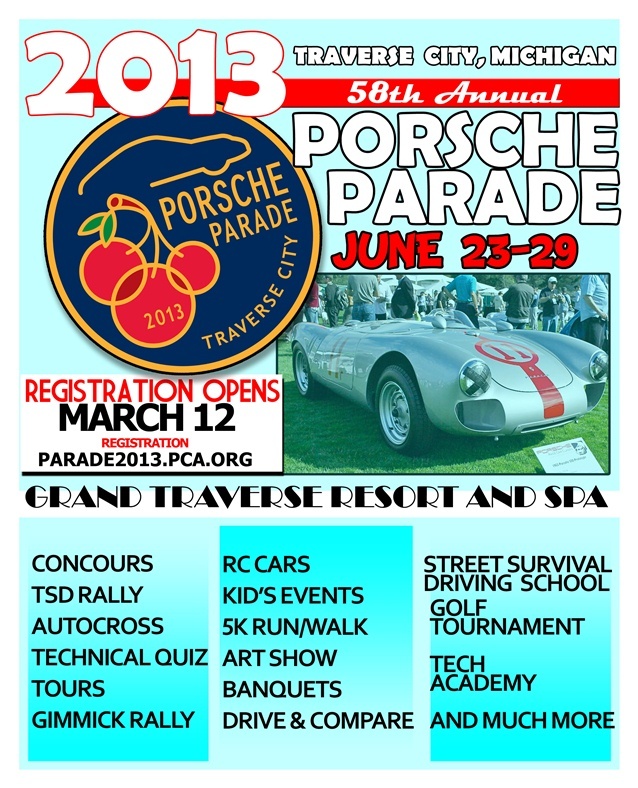 June 23 - 29 - PCA Parade, Traverse City, Mich. Parade is total immersion in Porsche and Porsche Club of America. You can attend and be laid back or fully involved by entering the many competitive events including a concours d'elegance, autocross, rally, technical quizzes and more. Details here. July 14 - Autocross at the Wisconsin State Fair Park parking lot. July 20 - Road&Track concours d'elegance in Elkhart Lake, Wis. Join us for a group drive to this event and an optional dinner at a great restaurant. Details here. Aug. 16 - Driver education at Road America. Save the date on your calendar for our region's day at Road America. Novices can learn how to handle their car on the track with the help of a driving instructor while intermediate and experienced drivers can continue to hone their skills as they navigate one of the best road courses in North America. For more information about the region's DE activities, visit the DE events page. The monthly get together for coffee on a Saturday morning is developing a regular following. Feel free to drop in when you have the time and spend 10 minutes or two hours. The conversation is always lively. The coffee is good. When the weather improves, some of the locations will require more "seat time" to get there but that's the point right? Here's a recap of the February get together of what we now call the Coffee Travelers. The best chili recipes in the state were tested and enjoyed by region members. Check out who took home bragging rights for the next year. One of our new paid classifieds advertisers, CH Detailing, provides these tips for washing and protecting the finish on your car. Check these articles out so you will be ready at the first sign of Spring when the roads are clear of salt. Classifieds are updated as they are received. Check out the latest here. Region member Norlan Kemp is organizing a group tour to Germany. Highlights include a special factory tour and visit to the Porsche Museum. Details here. This event is not sponsored by Milwaukee Region or PCA. Ceramic discs -- how are they made? Have you wondered how ceramic discs are made. Thought so. Learn more here. Book review: Check out this book about one woman's driving experience. Donna Daufenbach reports she hasn't done a book review in decades. This sounds like a great read, regardless of the gender of the driver. Check out the good news about the Boxster/Cayman here. And wait, there's more....a Cayman Test drive video here. German Cup Car Race...an interesting video. Watch it here. Thanks to Donna Daufenbach, Mike Jurkowski and Mike Wiviott for contributions. If you see a great video or article about Porsches, send it to the editor. Porsche Cars North America, Inc. (PCNA), importer and distributor of Porsche sports cars, Cayenne SUVs and the Panamera four-door sports sedan line-up in the United States, today announced record January sales of 3,358 vehicles. This compares to 2,550 vehicles sold in January 2012, an increase of 32 percent. 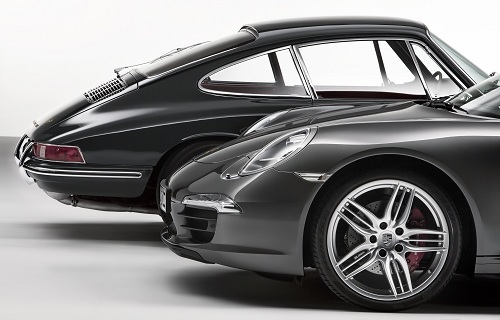 The successful month follows Porsche’s record-setting year in the U.S., with 35,043 vehicles sold in 2012. The Cayenne SUV and 911 models contributed to the record January, with 1,500 Cayenne units sold (+51% over January 2012) and 877 units of the 911 sold (+28%). The Boxster/Cayman line also enjoyed an impressive performance with 393 units sold, for an increase of 127 percent over last year. Porsche Approved Certified Pre-Owned vehicle sales were 857 for January 2013, an increase of 5.5 percent over January 2012 (812). Your board of directors and the committee chairs are available for your comments and ideas. You'll find the listing of these leaders online here.